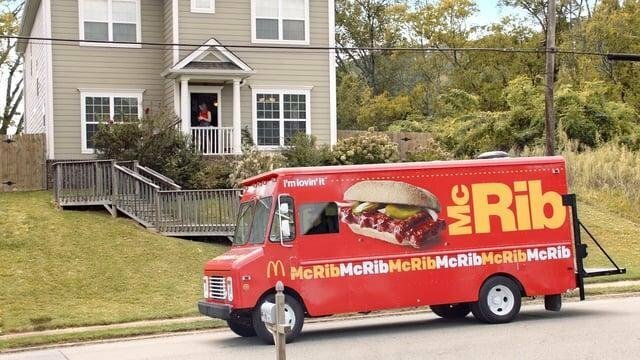 Franchise Equity Group: Advertising McDelivery - Already? 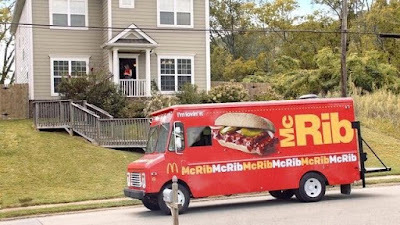 to introduce a younger generation to the McRib, isn't it too early be advertising delivery? Yet the concept of delivery is already on OPNAD? until fall to launch McCafe. So OPNAD went full steam into McCafe espresso, wasting millions in Operator ad $$$. all restaurants, B) Americans weren't interested in hot drinks in the summertime. tell media and analysts that 90 percent of McDonald's Operators support the program. a huge success. Of course their audience believes it after seeing all those commercials! Can McDonald's Operators stop OPNAD from prematurely advertising McDelivery? With the new Coop structure, Operators have even less control over Local marketing. And OPNAD insures that Corporate, NOT the Operators ,have total control over National advertising.OPNAD should change its name to MCD.CORP.AD . And the NLC is a TOTAL JOKE. You mentioned McCafe, which is an especially sore subject for me. Remember those “cells” we were FORCED to build, to hold these machines. One store- $85,000. Sold 7/day. Moved heaven and earth to sell ALL I COULD, too...after all, MY money paid for all of this, I wanted it to work but it was and still is all a giant train wreck. And not just for me. Then, somewhere along the way, “McCafe” turned into something other than espresso based drinks. Pretty sure coffee, OJ, even shakes were added. (Please correct if I’m wrong here). So, all of this AND new coffee blend that IS a home run was added to an embarrassingly underperforming brand that we paid for and now the numbers look way better...have I got all of this right? I’d really like for someone with a clearer memory to correct this, but if I’m even half right coffee and other products were intentionally added to “McCafe” line, maybe to prop up a failed project, a project funded by O/O’s. A project that we cannot even objectively measure because the water was intentionally muddied. I wonder how the ROI of espresso based McCafe ONLY looks? Include it all- capital expenditures, advertising, M&R...how does it stand as it started? And WHAT KIND OF PERSON does this? We all know the answer, it’s all about MY (sic) career. So if I’m right, who did this? Name names. Great leaders don’t hide, play tricks and obfuscate to serve their own agendas. They face facts and make moves that are sometimes uncomfortable. People support leaders who we trust. Who can we trust? And were/are shakes and OJ added? Are they still counted? Don Thompson became CEO due to his baby, McCafe. How'd that work out? So good, they sell it in grocery stores in competition to O/O's! McCafe enlarging the DT cell was changed within the first few months to Drive-Thru optimization after spending millions of OPNAD dollars promoting McCafe it never sold the amount of drinks it was intended to sell that's why they always came back and said it was not money wasted but more needed space in the DT ahh... "Drive-Thru Optimization"